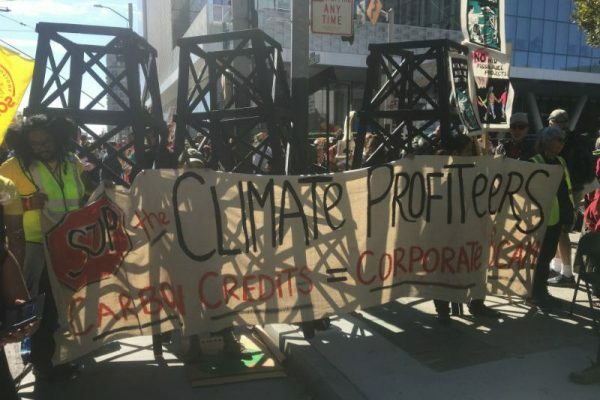 Above and below Climate summit protest, Climate Profiteers, by Joe Kukura, SF Weekly. Demonstrators block the entrance of the Global Climate Action Summit, claiming the conference is all talk and no action. 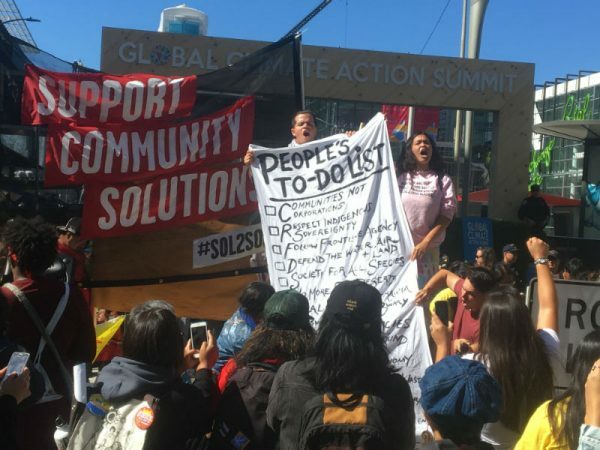 Climate summit protest in SF September 13, 2018 by Joe Kukura, SF Weekly. Political leaders and delegates attending Gov. Jerry Brown’s Global Climate Action Summit had a difficult time getting in to the conference Thursday morning. That’s because several hundred protesters successfully blockaded the summit’s main Moscone Center entrance, decrying what they call “Jerry Brown’s hypocrisy on climate change.” While conference attendees could still use other Moscone Center entrances, the demonstration did block the main Howard and Third Street entrance to the event. “We have shut this summit down from the outside,” demonstrator Dallas Goldtooth of the Indigenous Environmental Network told the crowd. The blockade was the culmination of a march that started at 7 a.m. Thursday morning, and blocked rush hour traffic in the South of Market area. It’s fair to note that some of the sponsors of the summit could be considered “polluting corporations.” Above we see an ad that McDonald’s promoted on Facebook, and yes, McDonald’s ‘Scale for Good’ campaign is a Global Climate Action Summit sponsor. Other summit sponsors include Amazon, Wells Fargo, United Airlines, and Bank of the West. Wells Fargo! They’re like the #1 funder of oil and gas pipelines. I live too far away, but these protesters are doing good work.